Dylan Windler (right) leads Belmont in scoring. Just because Belmont doesn’t have great name recognition in these parts doesn’t mean that Temple will have an easy pass in its NCAA Tournament play-in game against the Bruins on Tuesday night in Dayton. In fact, Belmont is seeded one spot higher than Temple by the committee, 42 to 43. Belmont, a 3 1/2-point favorite, won’t be a pushover. The Bruins compete in the Ohio Valley Conference, and they lost to Murray State, 77-65, in the OVC championship game. The Bruins have been idle since that March 9 title game. The Owls last played Friday, losing, 80-74, to Wichita State in an American Athletic Conference quarterfinal. While this will be the 10th time in coach Fran Dunphy’s 13 seasons that Temple is going to the postseason (eight NCAAs, two NITs), the Bruins have an impressive record of qualifying for the postseason under coach Rick Byrd. Belmont is competing in its 13th postseason in the last 14 years, including eight NCAA appearances. 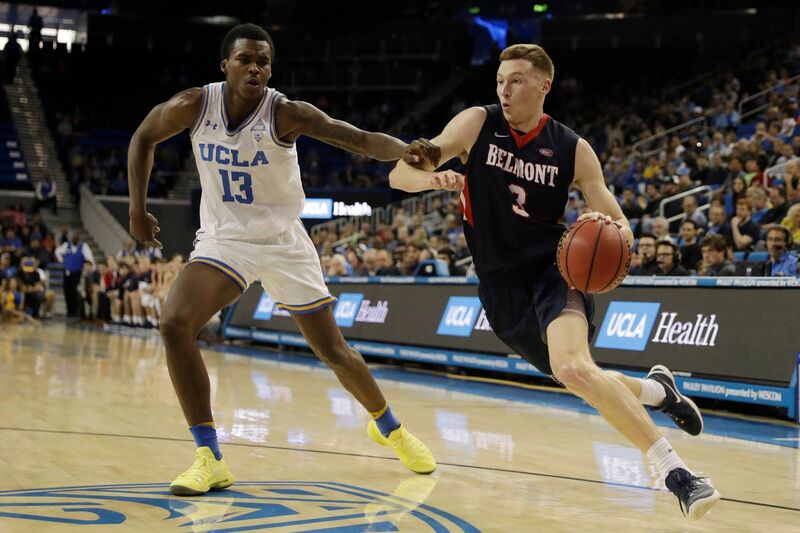 The Bruins, according to Belmont’s sports information department, are one of only nine NCAA Division I programs to win 19 or more games in 14 consecutive seasons (joining BYU, Duke, Gonzaga, Kansas, Louisville, Michigan State, North Carolina, and San Diego State). Both teams, which have never faced each other, will have a difficult time preparing, but that is the least of the worries for Temple guard Shizz Alston. “It is very difficult, but we are all used to playing AAU basketball where you are play two and three games a day, so we have to get back to that mindset,” said Alston, whose 19.7 scoring average leads the AAC. Tuesday, 9:10 p.m., at University of Dayton Arena, Dayton, Ohio. Coaches: Temple, Fran Dunphy (3-16 in NCAA Tournament); Belmont, Rick Byrd (0-7). Head-to-head: This will be the first meeting. The scorers: Temple senior guard Shizz Alston leads the American Athletic Conference in scoring, averaging 19.7 points. Alston is shooting 35.3 percent from three-point range, but he is getting to the line more (151) and leads the AAC in free-throw percentage (.907). ... Quinton Rose (16.5 ppg.) is a streaky shooter who has more confidence taking it to the basket. … For Belmont, Dylan Windler, a 6-8 senior, averages 21.4 points, shoots threes well (.430), and is an .846 foul shooter. Senior guard Kevin McClain (16.3 ppg.) is another outside threat, and 6-11 freshman Nick Muszynski is a threat in the low post. The defenders: Nate Pierre-Louis, a 6-4 sophomore, is the Owls’ best defensive player, capable of defending guards or taller forwards. … De’Vondre Perry, a 6-7 sophomore, usually comes off the bench, but he has frequently been guarding the opponent’s top scoring forward. … Senior 6-10 center Ernest Aflakpui doesn’t block many shots, but he has taken 52 career charges. … Belmont’s Muszynski has become a solid low post defender, averaging 2.1 blocked shots. ... Freshman point guard Grayson Murphy will gamble on defense, he averages 1.6 steals. Intangibles: Alston’s leadership is off the charts. He has willed the Owls to several wins and can put the team on his back. … Despite being a freshman, Murphy has become an instant leader for the Bruins. He has 204 assists compared to 77 turnovers and has become adept at running the offense. Don’t be surprised if …: Belmont puts pressure on Temple. The Bruins are a high-scoring team, averaging 87.3 points, and they will try to get in transition as much as possible. One way to do that is pressuring the Owls and looking to force turnovers.